Let’s face it. The student loan crisis is in full force. Borrowers are burdened with student loan debt and delaying big life milestones because of this financial ball and chain. Borrowers have $30,000 or more in student loan debt on average, and are pushing back homeownership, car purchases, and even marriage. Student loan debt is no longer part of a subculture of indebted young folks, but more of a mainstream problem. While student loan debt continues to be an issue, savvy investors and financial companies are looking to fill a void and empower borrowers with better rates through student loan refinancing. Student loan refinancing offers the option to refinance both your federal and private student loans and potentially get a better interest rate. If approved, your student loan payments could get a lot easier. No more paying multiple lenders, no more crazy high interest rates. Instead: one loan, one payment and (hopefully) a better rate, which could save you thousands of dollars. I’m personally a fan of student loan refinancing and think these companies are revolutionizing the industry and empowering borrowers by helping them save money. But, there are a few things you should know about student loan refinancing, before applying. Student loan refinancing may seem like a dream come true for some borrowers, especially those with high interest rates or with private loans. Refinancing can offer a substantial discount on interest rates and help streamline your payment. What’s not to love? However, not everyone will qualify for student loan refinancing. Most companies want you to have a “good” credit score — generally in the range of 680 or above — though each lender is different. In addition, they will look at your employment situation, debt-to-income ratio, as well as your income. Some companies even require you to work in a certain field or graduate from a particular school. So, if you are unemployed or have bad credit, you may not be a desirable candidate for refinancing. Some companies like SoFi and Earnest do a soft pull on your credit, so you can see if you qualify without affecting your credit score. Before applying, it’s important to look at the eligibility requirements of each lender. Each lender is different and will have different requirements, so read the fine print. The words “refinancing” and “consolidation” are often used interchangeably, but they don’t mean the same thing. Consolidation typically refers to a Direct Consolidation Loan, which you get through the federal government – for FREE! When you consolidate your loans, you are merging your federal loans to get one bill and your interest rate becomes the weighted average of your original loans, so you are not really saving money. The repayment terms are also longer, giving you up to 30 years to pay back your loan. Refinancing also means that you can merge your federal and private loans into one single payment, but you get offered a new interest rate as well — one that can be significantly lower than your current terms. However, the process is different in that you take out a new loan that pays off your old loans. This new loan is always offered through a private lender. It’s important to know the distinction so you can figure out which one is right for you. Student loan refinancing is a great option for those with stable careers and a goal of paying off their debt as soon as possible. But there’s one super important thing you should know before refinancing your federal student loans into private loans: you will give up certain federal protections. Federal student loans come with certain benefits like income-based repayment and student loan forgiveness. When you refinance your federal loans, they will essentially become private loans, so you will not be eligible for these options. This may not be an issue if you have a high-paying, stable career, but it’s important to know. What if you lose your job? What if you are unable to pay? Some lenders like SoFi and CommonBond have Unemployment Protection, which can put your payments on hold for a few months. But the benefits provided my student loan refinancing companies are necessarily different from the federal government. You get less flexibility, but you can also save money. Understand what you are giving up and make sure you can accept the terms and conditions of your new loan. Giving up income-based repayment and forgiveness options may be worth it, but it may not be for some. It all depends on your situation. Take a good hard look at your goals, income, and your repayment term to see if refinancing is right for you. The good thing is there are so many student loan refinance companies out there to work with. But they are not all created equal. I’m not saying some are bad or good — what I’m saying is each of them will serve your situation differently. Think about what you want and need as a borrower. How is their customer service? What interest rates are they offering? Are they fixed or variable? What are the repayment terms? How long have they been in business? What are others saying about this company? These are all important questions to consider when choosing a lender. There may be several good options out there, but you want to find the one that a) you qualify for, b) is the right fit for you. Of course, refinancing your student loans can save you thousands of dollars if you qualify. But each company offers various perks to their members, so before you choose one company over the other, truly understand what those benefits are. SoFi offers Unemployment Protection, and also has a unique Entrepreneurs Program for those that qualify. CommonBond has a Social Promise to give back — for each degree that is funded on their platform, they will fund the education of a student in need abroad, for one year. Finding the right refinancing company can be a lot like dating — you want to find the right one, that treats you right, and has your best interest and aligns with your values. Remember, it’s not just about if you qualify, but if you feel like it’s a right fit as well. That’s why there’s new companies out there like Credible which compare all of these major companies for you. You can input your information and Credible will show you what each of the major lenders will offer you for rates – lenders like Citizens Bank and RISLA. As a bonus, College Investor readers will get a $200 bonus when they refinance with Credible! 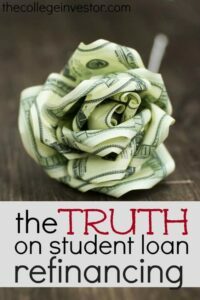 Before getting your student loans refinanced through a company, do your research about prospective options. Check out online reviews, social media outlets, and ask your friends and family for recommendations. Find out more information on their customer service policies, support, timeline, etc. As a borrower, you want to feel empowered with information, not stuck looking for answers. It’s important to understand if the company you want to work with is reputable. With so many student loan refinance companies out there, reputation is everything. Don’t get suckered in by advertisements or make the wrong choice out of convenience. You want to make sure you are finding the right company for you and not get sucked into a bad situation that could have been avoided. On the other hand though, it’s key to take everything with a grain of salt. It’s impossible to please everyone, so read reviews, both positive and negative, with a discerning eye. 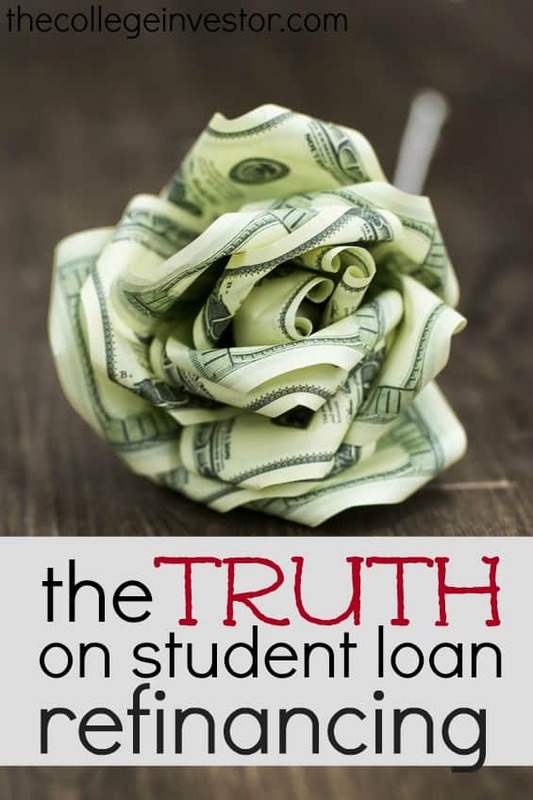 Let’s say that you know you want to refinance your student loans and that you make a good salary at your steady job. You have a high credit score and your debt-to-income ratio is fairly low. Essentially, you’re an ideal candidate for refinancing. You apply and you get rejected. Why? The company doesn’t offer refinancing for residents of Nevada. It’s crucial that you look at the eligibility requirements for each lender. Not only that, but read the fine print — you know, that small text at the very bottom that’s hard to read. Usually with important stuff about fees, disclosures, etc. You want to read that stuff so you know exactly what you are getting into. Understand if a company has an origination fee or prepayment penalty. You don’t want any “gotcha” moments, so do your due diligence and read the fine print. If you have student loan debt with higher-than-average interest rates (looking at you PLUS loans), refinancing can be a huge benefit from a financial point of view. However, as we know, it’s not all about money. It’s key that you understand the big picture and long-term benefits and consequences of refinancing. Understand what it means to refinance your loans and what you are getting out of it financially and otherwise. Most importantly, understand what you will be giving up, such as federal protections. Can you and your family handle that? Obviously, refinancing is not a good option for those looking to pursue Public Service Loan Forgiveness, Income-Based Repayment, or any other forgiveness programs (though those all have drawbacks as well). Take your time deciding if refinancing is right for you and do a full audit of each company. At the end of the day, you want to make sure you get a good bargain and that you are getting something good out of the deal. Are you thinking of refinancing your student loans or have already refinanced your loans? Let us know your experience!